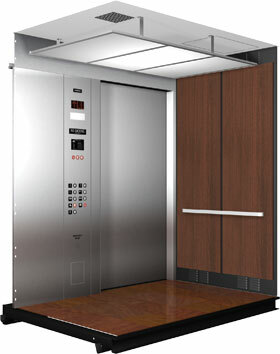 MEI takes pride in providing passenger cabs with craftsmanship build into every elevator. Our manufacturing process includes a thorough inspection of all cab materials. MEI’s Service Cab is our most robust passenger cab and features a painted steel shell. Walls – The walls are 16 gauge formed steel (shown in Light Ivory). Choose from our standard paint colors or define your own. The walls are also available in 14 gauge or 12 gauge steel and brushed stainless steel finish. Door – The door can be skinned in painted steel, brushed stainless steel, polished stainless steel, or patterned stainless steel. Sill – The sill incorporates hidden fasteners and is available in aluminum, nickel-silver, stainless steel, or bronze. Front – The front features 16 gauge stainless steel. The front is also available in 14 gauge or 12 gauge material, polished or patterned stainless steel, brushed bronze finishes, or painted steel to match the walls. Lighting – Fluorescent lights are recessed into the canopy for maximum space inside the cab. Handrail – The handrail is a hollow bar (½” x 1 ½”) with returned ends and brushed stainless steel finish. See page 35 for additional handrail options. MEI’s Plastic Laminate Cab is our most economical cab and features flush walls with laminate finish. Walls – The walls are wood core with laminate finish (shown in Green Legacy). Choose from our standard laminate colors or define your own. 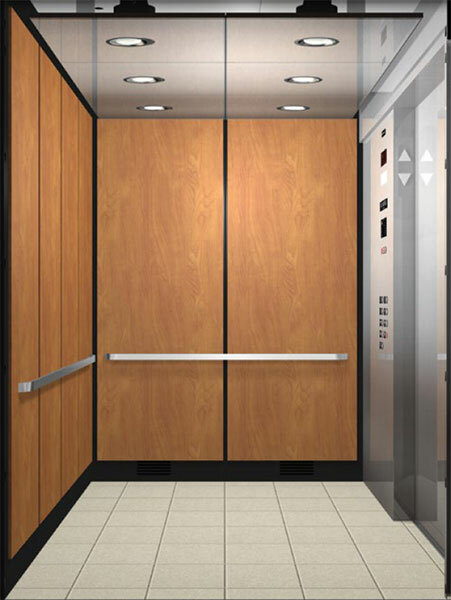 Door – The door can be skinned in plastic laminate, brushed stainless steel, polished stainless steel, patterned stainless steel, or brushed bronze. Front – The front features 16 gauge stainless steel. The front is also available in 14 gauge or 12 gauge material, polished or patterned stainless steel, and brushed bronze finishes. Canopy – The canopy is available in 14 gauge or 12 gauge painted steel. Ceiling – The drop ceiling features an aluminum frame with eggcrate diffusers. Lighting – Fluorescent lights are bolted to the canopy above the eggcrate panels. Handrail – The handrail is round (1 ½” diameter) with returned ends and brushed stainless steel finish. MEI’s Raised Panel Cab is our most popular passenger cab. It features a steel shell with raised panels. Walls – The walls are 16 gauge formed steel (shown in Flat Black). Choose from our standard paint colors or define your own. The walls are also available in 14 gauge or 12 gauge steel and brushed bronze or stainless steel finish. Panels – The panels are finished with plastic laminate (shown above in Wild Cherry), stainless mesh, textured stainless steel, or patterned stainless steel. 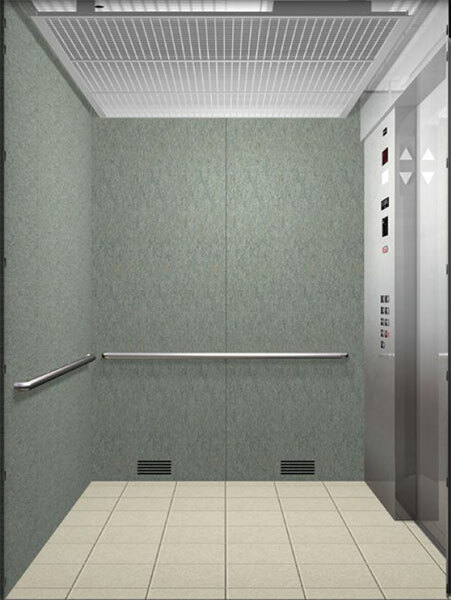 Door – The door can be skinned in brushed stainless steel, polished stainless steel, patterned stainless steel, brushed bronze, or painted steel. Ceiling – The island ceiling features a brushed stainless frame with high-voltage downlights. Lighting – The incandescent downlights are integrated with the stainless frame. Handrail – The handrail is a hollow bar (½” x 1 ½”) with returned ends and brushed stainless steel finish. Walls – The glass rear wall complements all of our other cab styles. The side walls are available in flush laminate, raised panel, steel shell, or glass wall. 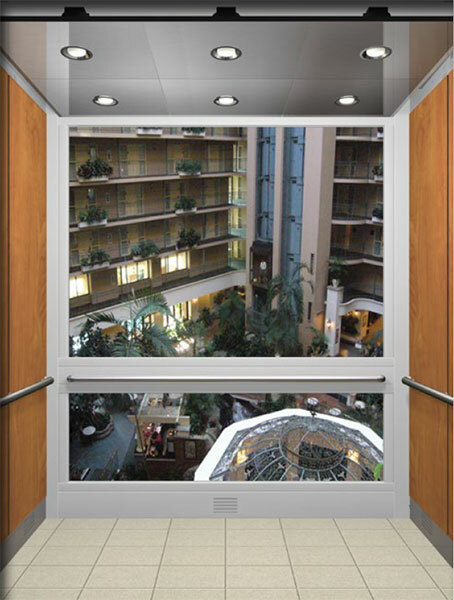 The glass can either be above the handrail or full height. The framing is available in 4 ½” x 1 ¾” aluminum tube with 1” sash or formed 16 gauge stainless steel. The handrail support beam is an integral part of this design and is included even if handrails are not needed. 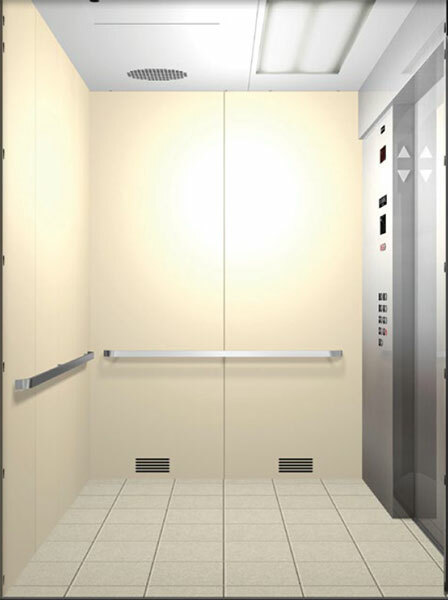 Door – The door can be skinned in brushed stainless steel, polished stainless steel, patterned stainless steel, painted steel, brushed bronze, or it can incorporate 9/16” safety glass. Lighting – The LED downlights are integrated with the stainless frame.